This is my entry for the contest. Had to reach into my collection for a couple songs I haden't listened to in awhile. All of these songs envoke a sad feeling both through lyrics and music. Hope you enjoy, will post a link once it has finished uploading. Sarah McLachlan is one of my guilty pleasures. Her singing on this song is so beautiful it could probably make a biker cry. The song was written about the Smashing Pumpkins touring keyboard player who overdosed on heroin. I’ll find some peace tonight." I didn't want to put this on here due to it already being present on a mix for the contest and the overuse of this track and others from the Garden State Soundtrack (I'm guilty), but this song is one of the first that came to mind. The accoustics and singing have such a sombre feeling and of course the lyrics are great. I just don't think I'll ever get over you." Probably the sadest song in the Opeth catalog and one of my favorites. Probably their strongest song lyrically. I connect with this song on many levels. And I know you'll never return to this place"
Not a big fan of this album, but this is an amazing song. Beautifully written, beautifully sung, and beautifully produced. If heaven is on the way"
Nothing but piano, vocals, mellotron, and a lot of reverb. Last (non-hidden) track from In Absentia. Again beautiful and sad. But I wouldn't stop you, if you wanted to stay"
Great song I heard first while watching Donnie Darko. It has a very depressing feel to it. This song, along with the next, is one of the saddest sounding songs I've ever heard. This song is a sort of inner dialog, which reminds me very much of my favorite poem: "The Lovesong of J. Afred Proofrock." Very safe but very all alone." Again, one of the saddest sounding songs ever. Radiohead is good at that. This song is slightly more up-beat sounding to keep you from killing yourself after the last stretch. Although, it talks about death so I may have failed. Feels somewhat akin to the next song "Hurt." Extremely sad, powerful song written by Trent Reznor. Just as effective (more to some) when sang by Johnny Cash. I prefer the NIN version, but definitely considered Mr. Cash's due to how powerful the context and video were. I will make you hurt." Beautiful and malencholy, but not too much. Great way to end. good mix, a kid i know is in a band called sad panda. any relation to that? Do you think future generations will look back at Zak Braff as a Jerry Lewis type? hey, i'm pretty sure i made this mix in 10th grade. 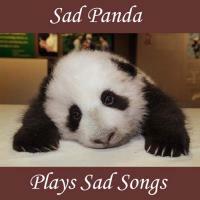 angsty panda, more like it.